The Garden is located on the Bokkeveld Plateau, 730 m above sea level and the vegetation is closely associated with the geology of the area. The oldest rocks are the shale beds of the Malmesbury System, through which one passes on the ascent of the escarpment at Van Rhyn’s Pass or Botterkloof. Above these lie the sandstone beds of the Cape System. On top of the sandstone is the Karoo System, represented by Dwyka tillite which is exposed along a narrow band running north to south. The Dwyka rocks were formed when a massive glacier covered the whole Karoo area about 300 million years ago. Tillite soils are derived from Dwyka sediments. These soils form a hard stony clay which drains poorly, is usually slightly acidic and becomes waterlogged in the wet season. Locally it’s known as vaalgrond, due to its yellow or grey colour which is caused by a chemical change that occurs during the wet season. The vegetation on these soils is known as Renosterveld, but very little remains due to agriculture. The north-south row of dolerite koppies that runs through the Garden is the remains of a dolerite sill. These sills formed when the magma was able to force itself between sedimentary layers. In other words they are parallel to the layers. Dykes are vertical (or nearly vertical) intrusions of magma cutting across sedimentary layers. Dolerite sills and dykes are intrusions of igneous rock formed by molten magma from the Earth’s mantle, which forced its way to the surface through cracks in the rock layers. Cracks may form when there is tension in the Earth’s surface, e.g. the break-up of Gondwanaland. The dolerite is more resistant to weathering and erosion than the surrounding sedimentary rocks so the dolerite stands out from the surrounding landscape as a row of koppies. Large boulders are typical of these koppies and were formed when the magma cooled relatively quickly, forming cracks and columns of rock. 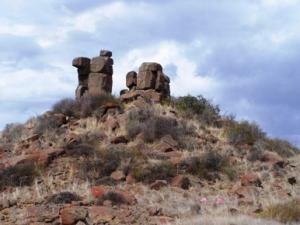 Erosion has weathered the bedrock and with time, weathering has produced the spectacular balancing rocks so evident in the koppies, such as Camel Koppie. Dolerite sometimes rises as low rocky hills that harbour several unique species, such as the endemic species of the scented arum, Zantedeschia odorata, Lapeirousia oreogena, Moraea vespertina and Sparaxis pillansii. 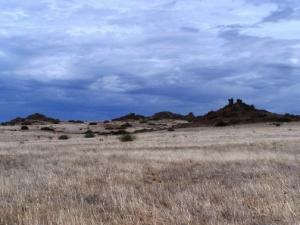 The dolerite beds were formed during an episode in the Jurassic period (180-135 mya) when lava erupted across the southern African landscape. Dolerite beds give rise to a fairly rich soil which is very fine in texture and neutral to alkaline. The soils are known locally as rooigrond (red soil), due to the high iron content, which rusts to give a deep red colour. Rooigrond has the ability to shrink and swell during alternate dry and wet periods. During the dry periods, massive cracks form, that result in a self-mulching process in which topsoil falls into the cracks and subsoil moves to the surface. These soils are called vertisols. The soil is very fertile but the soil nutrients are easily depleted by cultivation. Many of the Nieuwoudtville endemics can be found on these soils. Spectacular flower displays can be seen from winter to spring. Beyond the koppies, on the eastern side of the Garden, the soils are also derived from dolerite, but have a more sandy structure. These soils eventually give way to tillite and then soils derived from Ecca shales. The Ecca shales form a fairly flat landscape which covers a large portion of the Karoo.